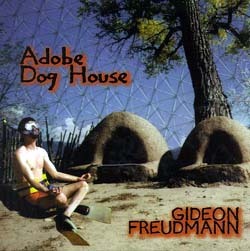 Gideon Freudmann "Adobe Dog House"
Quirky and unique, Freudmann has quickly gained a reputation as one of the most original and talented cellists (and composers for the cello) in the country. His music has been played on syndicated NPR radio shows, and he is a favorite on the coffeehouse/college/in-store circuit. Included on this release of 10 instrumentals and 6 songs is his bizarre and unique version of "Somewhere Over the Rainbow".